Discover what makes London style so special with a trip to one of the capital's top shops. From famous department stores to grand food halls, some of the world's biggest and best shops can be found within this fashion capital. One of the oldest and most famous stores in Piccadilly is home to a fine food emporium. The Royal Family's favourite food hall, Fortnum & Mason is one of the oldest and most famous stores in Piccadilly, if not the capital. After 300 years of trading, this historic department has a pre-war gentility; its gilded furnishings and exquisitely wrapped produce offer an appealing anachronism in today's modern age of convenience. Quintessentially English, this historic department store owes its royal patronage to William Fortnum's grandson, Charles's years of service with Queen Charlotte. Still the purveyor of food and wine to the Royal Family, Fortnum's is a must-see for anyone visiting London. Opened by Messrs Fortnum and Mason in 1707, the store has supplied provisions during both the Napoleonic and Crimean wars. Despite stocking a solid range of accessories, perfumes, furniture and homeware, the shop is, understandably, famed for its fantastic, upmarket food hall piled high with gastronomic delights and adorned with chandeliers and marble pillars. Some of the delicacies here are a little overpriced but the quality is exceptionally high. If youre visiting London in the summer months and want to sink your teeth into a top-notch picnic hamper, look no further; Fortnum's has supplied hampers to high society types at events such as the Henley Regatta and the Ascot Races. Even if you're not a foodie, the shop itself is worth a visit just to check out the fantastic decor. It is also an excellent place to pick up a gift. All the delicacies and luxuries on sale here come so beautifully packaged you won't want to open. Possibly the most famous store in the world. 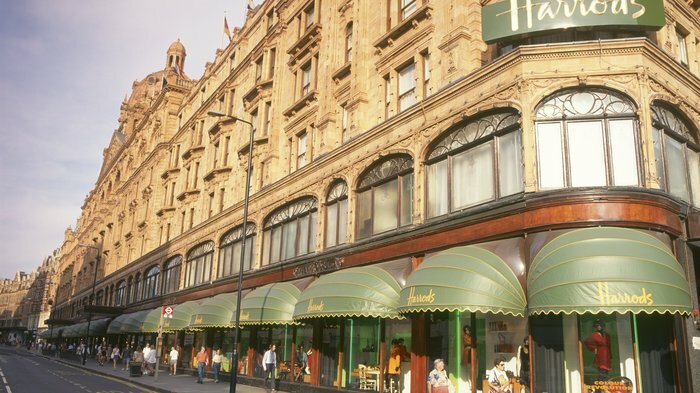 Britain's most famous store and possibly the most famous store in the world, Harrods features on many tourist 'must-see' lists - and with good reason. Its humble beginnings date back to 1849, when Henry Charles Harrod opened a small grocery shop that emphasised impeccable service over value. Today, it occupies a vast site in London's fashionable Knightsbridge and boasts a phenomenal range of products from pianos and cooking pans to pets and perfumery with a large Hair and Beauty department its crowning glory on the top floor. The Food Hall is ostentatious to the core and mouth-wateringly exotic, and the store as a whole is well served with restaurants. At Christmas time, Harrods boasts an enchanting Santa's Grotto for the kids and an extensive range of festive decorations. The summer and winter sales are calendar events in the shopping year, and although both sales are extremely crowded there are some great bargains on offer. A glamorous shop with a history of theatrical shopping. Don't be fooled into thinking that this huge department store is simply a Mecca for commercialism and shopaholics. Selfridges has a truly fascinating history that supports its excellent reputation for providing a huge range of high quality goods. Emphasising the ethos that "shopping should be fun", the stores original founder, US entrepreneur Harry Gordon Selfridge, defined the shop's hands-on, theatrical image that has endured since its opening in 1909. A lover of all things scientific, unusual exhibits were often used to attract and amaze customers - John Logie Baird carried out his first public demonstration of television from the first floor of the store in 1925, it was in Selfridges that 12,000 people viewed the monoplane used to complete the first cross-Channel flight, while a seismograph installed on the third floor, recorded tremors from the Belgian earthquake in 1938. This tradition for unique displays and unusual exhibitions continues to this day and is a major reason to visit the store. Selfridges' ever-changing window displays always attract immense interest and are consistently groundbreaking and often controversial - one of the most bizarre has to be the series of Japanese-inspired characters used to depict scenes from TV dating shows, which in turn encouraged shoppers to record their own personal video ad in one of the dating pods located in-store. Scores of excellent clothes retailers, a superb Food Hall, and a number of first class restaurants all under one roof make Selfridges, understandably, the biggest draw on Oxford Street. With more than 40,000 toys, this seven floor store is heaven for children. Stepping into Hamleys you are greeted by a colourful scene of frenetic activity. Miniature trains career under escalators, model planes circle above your head and mountains of soft toys spill across the floor. Famed as the one of the largest of its kind across Europe, Hamleys has been the leading toy shop for over 250 years. Founded by William Hamley in 1760, it first opened in a poky shop in Holborn before moving to Regent Street in 1881. Hamleys keeps up with the latest gadgets and trends as well as stocking the more time-honoured toys. From tin soldiers to the latest in Jedi fighting equipment, kiddies can feast their eyes on over 40,000 different toys. There is something for every price range, however don't be surprised by some of the wildly steep price tags. Adults and children swarm around the store, eyes shining with excitement. The experience alone is worth a visit. Many of the toys are out of the boxes and can be endlessly tossed, shaken, driven, built or cuddled. With seven floors of fun your raucous bunch can charge from floor to floor with glee. A sleek and fashionable store that's home to a huge variety of products. The younger, more fashionable cousin of Harrods, 'Harvey Nicks' started out life in 1813 as a simple linen shop. With both department stores being located in Knightsbridge they're often compared, but while Harrods offers huge variety across a massive range of products, this classy retail store offers designer clothes, furnishing and food of a quality far superior to anything you would find down the road. Its sleek, streamlined interiors and clean and minimalist design allow the products to do the selling - and with great effect. All your favourite designer labels are here, including ultra-hip Alexander McQueen, Comme des Garcons and Versace. In 2012 the store's third floor was given the welcome addition of the Beauty Mart. A cross between a boutique and every girl's dream dressing room, the Beauty Mart only stocks the bestselling products from popular brands and also treats customers to international products that can't be found anywhere else in the UK. Add to this some beautiful homeware, fearfully stylish bars and restaurants, and the Fifth Floor Cafe with its spectacular views across west London and you've already spent a day here. Surprisingly there are also some real bargains to be had in terms of top-notch designer wear. A place to see and be seen as much as to shop, this beautiful department store offers the most refined fashion shopping experience of any store in London - a fantastic spot for an afternoon of shopping, eating and celebrity spotting. This visually striking store is known for its impressive association with design. No other shop in London, if the world, has such a strong iconic association with design. Mention a 'Liberty print' and a clear image of the shapes, colours and textures involved immediately springs to mind. Housed in a striking, timber-framed, Tudor revival building on Regent Street, the powerful Liberty brand extends to the distinctive style of its surroundings. With small, intimate staircases, intricately designed elevators, wooden balconies and glass atriums this has to be one of the most aesthetically pleasing and unique department stores in the city. Just wandering around it particularly at Christmas time, when fairy lights adorn the ceiling is a real joy. Since it opened in 1875, Liberty has captured the hearts of shoppers around the world, finding fame and popularity in the 60s with designers like Mary Quant and Jean Muir producing the shops own line in fabrics. Liberty's dedication to innovative design and Eastern influences reflects its founder's fascination with Japan following the International Exhibition of 1862. Not content with merely following trends, Liberty regularly showcases and sponsors new designers, offering cutting-edge style; from cosmetics and jewellery through to home and fashion - there are names like Martin Margiela and Comme des Garcons nestling alongside Betty Jackson. Covet the designer womenswear, ogle the arts and crafts antiques or simply watch would-be fashion designers drooling over the textiles in the fabric department. Fabulous. The world's largest Apple store is a beautifully restored 1876 building. Following the runaway success of its flagship Regent Street branch, Apple has opened its largest store in the world to date with this three-storey gadget emporium in Covent Garden. Located in a former nightclub and restaurant in Covent Garden Piazza, the new store is the Californian company's 300th retail outlet in the world and employs 300 staff. The first thing you'll notice is just how spacious the place is: centred around an airy open atrium there are separate rooms (each with exposed brickwork, oak tables and stone floors) for iMacs, MacBooks, iPads, iPhones and iPods. Welcome services include a special Start Up Room, where you can be talked through how to set up your new Apple product free of charge the moment you've bought it; a Community Room for advanced workshops; and a Genius Bar, where experts will gather to answer any Apple-related problems. Apple's Regent Street Branch, the first to open outside the US back in 2004, is the most profitable shop in the UK, bringing in £60m a year. We expect the new Covent Garden Branch to give it a run for its money. Home to beautifully crafted and cutting edge design. Though it was established in 1800 Heal's is renowned for its beautifully designed furniture, attractive modern decorations and hyper-modern kitchenware. The Heal's trademark has become synonymous with quality stocking home furnishings of the best design and craftsmanship. Such quality is, needless to say, reflected in the price tags but some pieces are worth paying that little bit extra for! The store also features rugs, beds, fabrics and home accessories - everything you need to create the dream home. If you're looking for inspiration, take advantage of the interior design service. The world's largest fashion store for men and women. Cutting-edge designs at high street prices are what make Topshop the best, the biggest and the most popular fashion retailer on the market. It's not unusual to see crowds of keen customers hanging around outside the store early in the morning desperate for the doors of the "world's largest fashion retailer" to open. Similarly, the store has become an iconic meeting place - whatever the time of day you'll see individuals hugging mobile phones leaning against the windows waiting for friends or partners, desperate for them to be late so they can pop back into the shop and have another quick rummage in the meantime. Located right on the corner of Oxford Street (one of London's busiest locations) this vast emporium is not just the largest Topshop in the country - it is a tourist attraction in its own right. There are literally thousands of tops and dresses for sale here (Topman is on the same corner) and it is quite a scene on a Saturday. It can be hard to track down a dream item among the massive crowds, but anybody visiting Oxford Street should pop in here to check out the mayhem. Truly, when it gets busy, this place is remarkable. Spread over various floors and sections the store now houses a huge area dedicated to accessories, a vintage section, boutique and maternity collections, a nail bar and fitting area. Championing young and new designers, unique, exotic ranges complement the store's trademark, inexpensive plain tops, jeans and basic collections. This shop is huge and swarming with merciless fashion victims. Expect the odd bit of jostling and elbowing when you do go in but it's worth braving the odd ruffian in order to bag some of the best bargains in town. One of Britain's favourite and most reliable brands. This enduring retail partnership began back in 1894 in a small shop in Manchester, but Marks and Spencer (M & S) now boasts more than 300 stores in the UK and 400 stores worldwide. M & S is one of Britain's most reliable and trusted stores, famed for selling high quality food, clothing and lingerie and household goods. Its ready meals, cakes, and desserts are some of the best on the market. The sandwiches, fruit and vegetables are of a consistently high standard, though not exceptionally cheap. The clothing line (including the Per Una range - not carried by all stores), is high quality and fairly priced. The store also continues to be a stalwart supplier of homeware, toys and beauty products. The company prides itself on the virtues of quality, service, innovation and trust. It very rarely fails to deliver. A fine British shopping institution. From cheap budget places to stay to luxury 5 star hotels see our deals for hotels, including The Royal Horseguards - A Guoman Hotel from 39% off.